If you’ve got a big family and you’re thinking about taking a summer road trip this season, either to beat the heat or to soak up the sun, then the 2015 Suburban might be exactly what you need. The all-new Chevy Suburban can tote around up to nine passengers—and since seven of those are more likely than not children or teenagers, the Suburban’s plethora of innovative technology will come in handy. To entertain your cranky, cooped up kids, the 2015 Suburban offers wireless headphones so that each passenger can independently experience the available Blue-ray™ overhead entertainment screens, as well as the satellite radio or any media devices that might be synced through either MyLink’s Bluetooth® connection or the built-in USB ports or SD card slots. 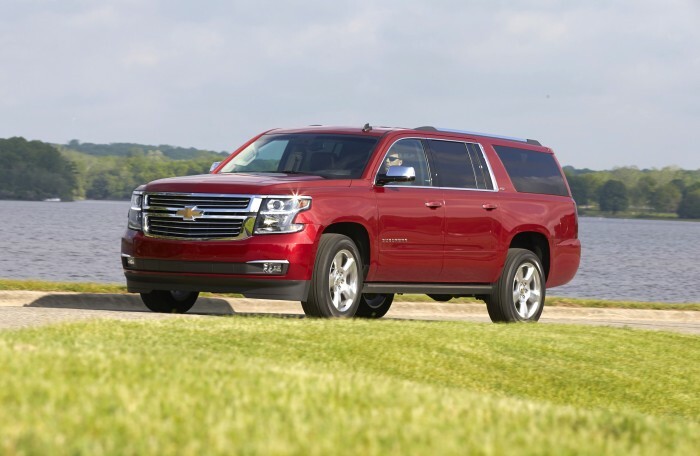 And to keep the kids at bay for the entire trip, the 2015 Suburban offers a composite plug-in in the center console so that passengers can play a game system through the overhead, 9-inch LCD screens. And don’t worry about your kids powering down: there are 12 power outlets available for on-the-go charging. The Suburband carries all the latest entertainment technology for your passengers. Plus, the Suburban will be available with OnStar 4G LTE, which allows for up to seven devices to sync up to a built-in Wi-Fi hotspot. And with a range of 30 feet, the family can enjoy the Wi-Fi connection even during pit stops. Of course, family vacations are about enjoying each other and not just your screens. When you arrive at your destination, you’ll have plenty to do together, as the 2015 Suburban boasts a max trailering capacity of 8,300 pounds, making it the perfect vehicle to transport boats, bikes, camping trailers, four-wheelers, and more. The Suburban has a max trailering capacity of 8,300 pounds. The Suburban also has plenty of room to pack all your gear inside, whether it’s the ingredients to s’mores, board games to play in the cabin, or all your fishing gear for a day on the lake. In fact, the 2015 Suburban offers up to 121.1 cubic feet of cargo space, when the second- and third-row seats are folded down. If your family is bigger, the versatile Suburban offers other seating configurations, including a 60/40 split rear row and a folding second row. Storage is no issue for the 2015 Suburban. 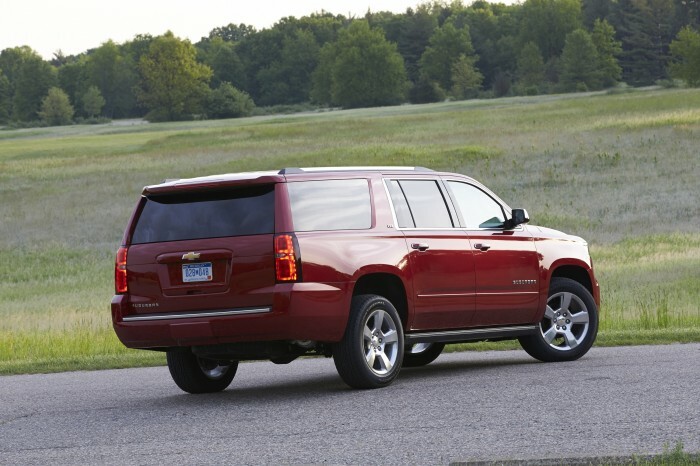 Oh, and did we mention that the Suburban’s fuel economy is the best in its class? While 22 mpg on the highway might seem rough, it’s the best you can do when you’ve got a family so big. Luckily, however, the Suburban holds 31 gallons of fuel, so you won’t have to make too many stops. And because it’s your family we’re talking about, safety is key. 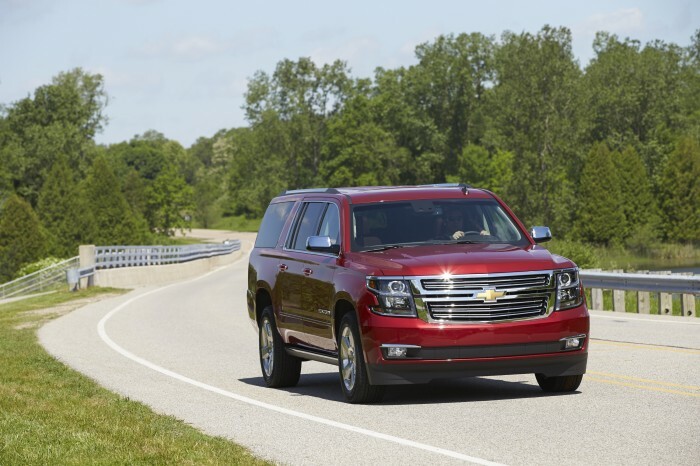 The Suburban is laden with the latest safety features, including Adaptive Cruise Control, Front Automatic Braking, Side Blind Zeon Alert, Lane Change Alert, and Rear Cross Traffic Alert. 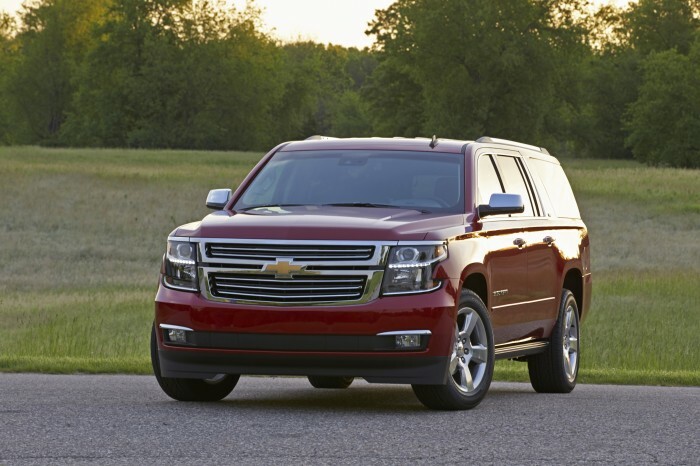 The all-new 2015 Chevy Suburban went on sale alongside the 2015 Tahoe earlier this year.